The history of life on earth has been a history of interaction between living things and their environment. So begins the second most famous book on life: Silent Spring, by Rachel Carson. It is a book that changed how we look at the world around us, in a way bettered only by Charles Darwin’s classic, The Origin of Species. Carson’s message is the opposite of that of Darwin. The Origin of Species turns a bleak view of a winner-takes-all world into a perspective of continuous, rapid evolution and improvement of the species. In Silent Spring, unimpeded progress leads to insecticides so powerful that they kill far more than is revealed by the competing companies that create them; the struggle for company survival sacrifices the environment, and in result, risks our survival. Later, it was realized that Darwinian evolution does not provide a guaranteed path to progress. What is best for the individual may well be detrimental to the species, and thus the survival of the fittest can eventually lead to extinction of the species. The two books aren’t so far apart. In evolution’s struggle, even the winners can be losers. In the end, Carsons’ powerful warning came just in time. Against strong opposition of the industry in question, the worst excesses were stopped. Our world is far healthier now than it was 50 years ago. Still, bad errors happen. The Bhopal pesticide disaster injured over half a million people and killed over 3000. More recently, there is the antibiotic that inadvertently killed all vultures in India. Restricted there, it is now exported to Africa instead. Some people never learn. The demise of honey bees is also fairly conclusively linked to two neonicotinoids, imidacloprid and thiamethoxam. As Carson writes: It is our alarming misfortune that so primitive a science has armed itself with the most modern and terrible weapons, and that in turning them against the insects it has also turned them against the earth. But no evidence can be strong enough for companies that make their fortune from such chemicals. In the post-modern world, companies can be larger than their governments, and if they don’t like environmental restrictions, they can buy a new government. And so the silent spring has turned to autumn. But this has all happened before. From the demise of the dinosaurs to the disappearance of Homo Floresiensis, extinction has been a way of life. Sometimes extinctions peak: in a short amount of time much of life goes. As Carson surmised, this shows something dramatic has happened to the environment. Worst of them all was the mass extinction at the end of the Permian and start of the Triassic, 251 million year ago. This came close to sterilizing the Earth. And all because of an errant insecticide – and a Siberian volcano. The continents had come together to form a supercontinent, called Pangea. It was partially dissected by an equatorial ocean, the Tethys, and surrounded by a world-wide ocean, Panthalassa. The Tethys is now gone, but Panthalassa still exists: over the ages it became our Pacific. The time was 200 million year after the Cambrian explosion. Life had multiplied; it has conquered the land, and learned to fly. A large ice age 280 million year ago was a set-back but as temperatures recovered and the earth grew warmer again, tropical abundance was everywhere. Huge forests had developed; they left coal deposits throughout the modern world. Reefs abundant with life rimmed the tropical coasts. Over 500 different types of fossils have been identified. The reef was not build by modern corals: these had not evolved yet. Instead, the frame of the reef was created by sponges, which form a light, tufa-like rock with lots of holes for other creatures to occupy: colourful fishes, rays, sharks, but also ammonites (shells with tentacles), sea urchins, and a single-celled organism growing to 10 cm across. It was a reef, but not like our reefs. The forest was equally different. The trees were huge, but were in fact giant ferns. Conifers were slowly replacing the ferns, as seeds superseded spores. There were no birds but plenty of cockroaches. Beetles began their conquest of the world. There were still trilobites in the sea. Large animals were abundant. The dominant ones were mammals: cynodont, a pack-hunting predator, lystrosaurus, a small vegetarian, and huge dimetrodon, a lizard with a big sail on top. Surprisingly in this pre-Jurassic age, the ancestors of the dinosaurs were around but in the minority against the mammalian line. It was life, but not as we know it. The time of plenty was not to last. During the Permian, the climate had grown more hostile, as global temperatures had continued to rise. Warming is common during a supercontinent phase. 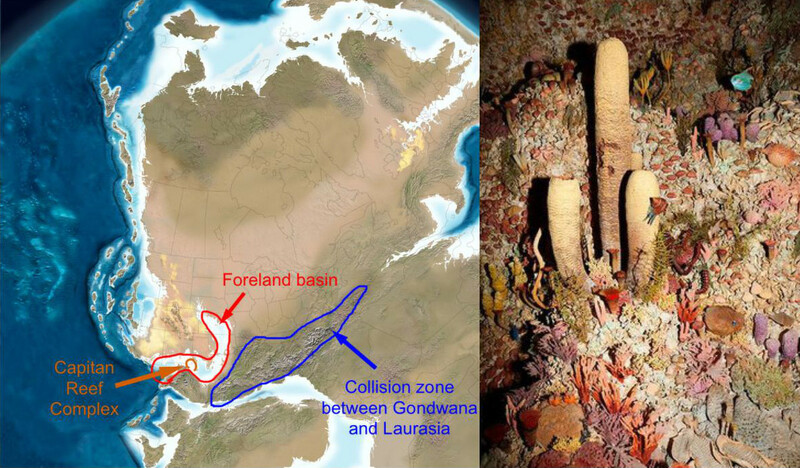 During the assembling of the supercontinent, oceanic subduction zones are actively pulling the plates together. But once that has happened and the continents have collided, the intervening oceans have gone and the original subduction zones have become mountain ranges. The cessation of subduction changes the global carbon cycle. Subduction is the main way by which the Earth removes excess CO2 from the atmosphere: it dissolves in the water, becomes carbonates, sinks to the ocean floor and gets carried into the mantle, over a period of 100 million year. At the same time volcanoes slowly put recycled CO2 back into the atmosphere. Everything is nicely in balance. But once subduction ceases, when the supercontinent is in place, CO2 levels begin to rise, and temperatures in consequence go up. Thus, supercontinents tend to be hostile hothouses, without ice or snow even in the polar regions. As the Earth began to heat, the interior of the huge continent dried out and became a desert. The sea level dropped and the shallow seas dried out. Life was stressed, suffering in the desertification. Reefs were reeling with the demise of the shallow seas. And suddenly, 251 million year ago, it was all gone. The fossil record dries up almost from one day to the next. There were two separate events, 200,000 year apart. The first one was the famous Permian extinction. The second was the early Triassic extinction. The two events hit different types of families, so that animals or plants that survived the first event fairly well, still succumbed to the second. A third wave of extinction occured a million year later. After the double, or triple, whammy, 90% of sea families were gone, and 70% of all land species disappeared. This is number of families: the number of individual creatures must have gone down far more, perhaps by 99%. If this had happened to us, the human population of the world would have been reduced to just the French (or less euro-centric, just the Thai). Even insects, which sailed through ever other extinction event, suffered extinctions. Plants were equally hit: the forests were gone, and instead, the fossil records shows enormous amounts of fungi, presumably feasting on the dead wood. River plains changed from meandering to braided channels: this means they were flowing faster, and this is what happens if the rivers are not impeded by plant growth. Braided channels were normal before life conquered the land. With plant life gone, herbivores were in trouble. Without herbivores, predators had a hard time. Beetles survived – not much else did. This was truly the time the world came closest to sterilization. It was the ultimate silent spring. Recovery was extremely slow. It took as long as 30 million year for the eco system to regain its previous abundance, but with an almost entirely new cast of actors. Among the many victims were the trilobites. They had survived everything the Earth had thrown at them before, but as cold-water creatures had been flagging already in the heat of the late Permian. They did not make it. 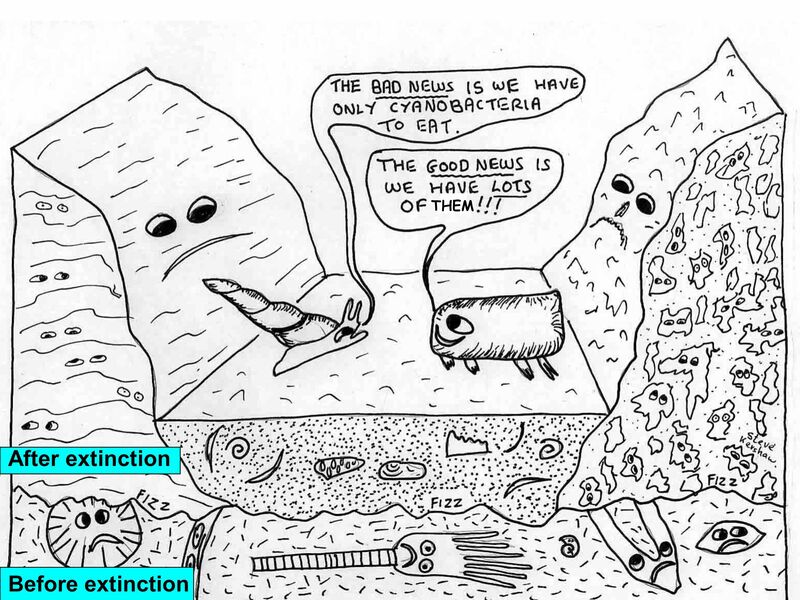 But the impact of the extinction went far beyond the trilobites. The future of the world was changed. The crater of Permian doom? For the biggest extinction in the fossil record, worse even than the dinosaur-killing K-T event, the cause must be something dramatic. Naturally, people have looked for a major impact. There have been claims that there is evidence for this, from peculiar isotopic ratios of sulfur and carbon. But there is no debris layer, and no crater. Recently, a possible crater was located underneath the ice in Antarctica: radar showed the presence of a very large partial ring, and gravity measurements showed a mass concentration under the ground. If this is an impact crater, it is twice the size of Chicxulub, the K-T crater. But the evidence is not sufficient. The proposed crater ring is incomplete. The crater formed very close to Australia (at least where Australia was at the time, within Gondwana) but the relevant area in South Australia has no indications for a major impact. The mass concentration (mascot) can also come from mantle activity. And finally, there is no date for the crater, so even if it is due to an impact, it can’t be linked to the Permian-Triassic boundary. At the moment, the nayes have it: the case for the Permian extinction to be linked to an impact is unconvincing. But the impact theory is not dead yet: more evidence may still be found. From Von Frese et al. 2013, Tectonophysics, 585, 185. 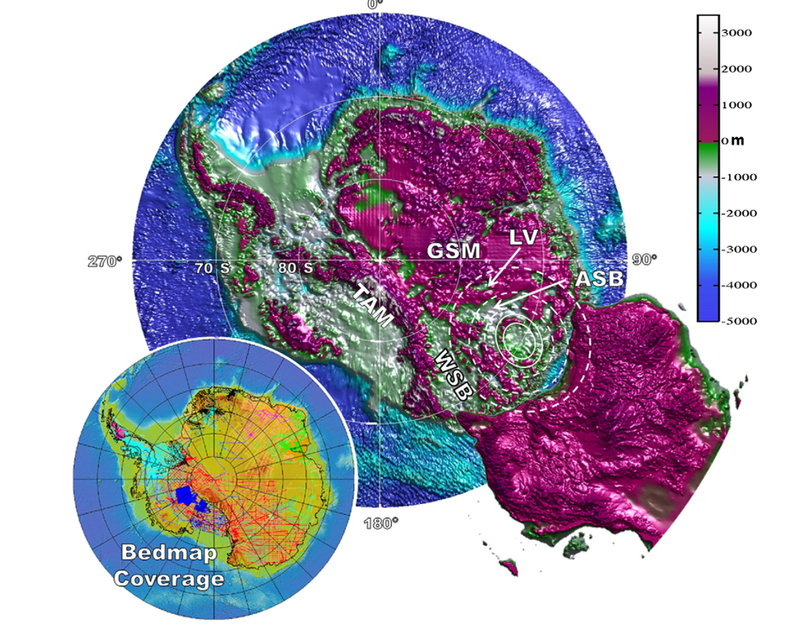 Topography of Antartica below the ice cap. The white circle shows the proposed Wilkes Land crater, 500 kilometer across, which coincides with a mass concentration and a magnetic anomaly. The location of Australia relative to Antarctica, as it was in the Permian, is also shown. But there is a much bigger smoking gun, hiding in the world’s other frozen wilderness. Siberia holds the record for the largest volcanic eruption on land known to us. And the timing of this eruption coincides exactly with the Permian extinction. The Siberian Traps make Iceland seem a children’s playground, and Yellowstone a volcanic midget. The Siberian Traps cover much of Siberia. The exact extent is not known, as large parts are buried beneath more recent sediments. The volume is also not accurately known. The lava flows are up to 4 km deep, obviously not single flows but deposited over many separate eruptions. The area is estimated as 2 million km2, but possibly 2-3 times more, and the volume between 3 and 5 million km3. This makes it the largest flood basalt eruption for which we have decent data. If all the lava flows had entered the sea, it would have raised sea level across the globe by 20 meter. (In fact a flood basalt eruption under the sea would raise sea level by much more than this, because the inflation prior to the eruption is much more voluminous than the eruption itself). The eruption started 257 million year ago, southeast of the Ural mountains where the first rifts opened. For a while things quieted down, but the eruption restarted around 251 million year ago, further northeast. The heavens, or rather, the ground, opened, with massive flows each 50 meter thick and traveling 100’s of kilometers. Each individual flow may have contained 1000 km3 of lava, and they occured as often as once a century. This second beginning was 300,000 year before the extinction event, and it continued until 800,000 year after. 2/3rd of the lava was erupted in the pre-extinction phase, but is not known whether this was continuous or episodic, and whether the eruption had further intensified around the time of the extinction. In any case, the close alignment between the eruption and life’s wipe-out leaves little doubt about the relation. Whether the eruption occured in pulses, and one of these pulses provided the killer blow, is up for discussion. 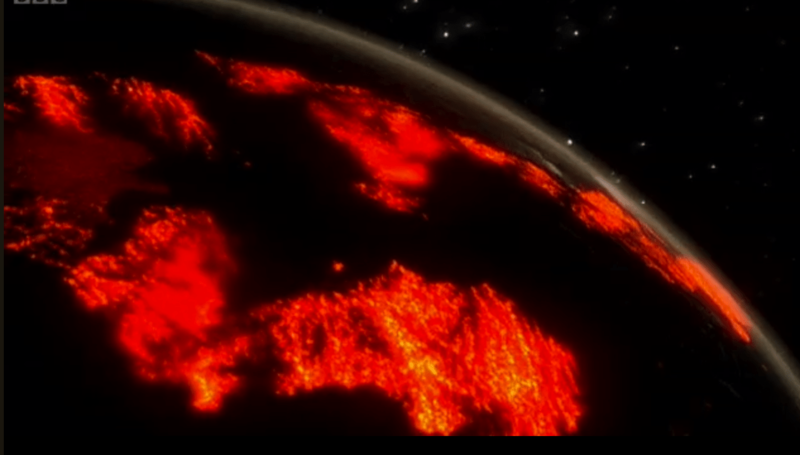 From space, the eruption would have been a spectacular sight, although not quite the size as shown on this BBC visualization. What caused the Siberian eruption? It may have been a mantle plume, or edge convection caused by the thick insulation of Pangea: the eruption happened next to the Siberian craton, in a place where the lithosphere suddenly became much less deep: those may be ideal conditions for edge convection. The arguments are finely balanced. The tell-tale indicator of a mantle plume would be a dramatic inflation prior to the eruption, a huge bulge within the continent perhaps 2-3 kilometer high. But there is little evidence for such inflation, and this is the main weakness of the mantle plume model. In either case, the lava composition is from the mantle, but it is strongly fractionated, showing that the magma resided in or under the crust for a long time. Some continental crust melted into the magma. The Siberian Traps left kilometer-thick layers of flood basalt, brought into view by deep erosion. But how did the eruption cause the mass extinction? One piece of evidence comes from other mass extinctions: only flood basalt eruptions on land seem to correlate with extinction events. Those which occured under the sea did not. This suggest the immediate cause is in the air. Was it the sulfur? Fluorine? A volcanic winter? The pieces of the puzzle are beginning to come together, and it appears it was none of these. The Permian killer was a combination of lethal global warming and anoxic oceans. The tropical Tethys ocean had warmed substantially during the late Permian. And towards the end, slow warming became rapid warming. The rapid rise lead directly to the extinction event. The heat lasted for five million year, before finally a return to cooler climates. The temperature range was extreme. The ocean warmed by more than 10 C, to a peak temperature in excess of 35 C, possibly as high as 40 C. Very little complex life can live in water above 35 C, and no photo-synthesis can occur. The land may have reached temperatures of 50-60 C. The Great Dying was death by heat stroke. The rapid temperature rise was clearly caused by greenhouse gases. We know this because of a change in carbon during the rise, with an increase of the fraction of ‘light’ carbon (the isotope C-12) compared to the heavier C-13. This can only be caused by the addition of a new carbon source. It is natural to blame the volcanic eruptions for this, especially since there was also an increase of ‘light’ sulfur, which is typical for the mantle. At the current time, volcanoes emit up to 600 million tons of CO2 per year. That may seem a lot, but human activity emits 40 times as much. (Note that most of the volcanic COc does not come from eruptions but from quiescent degassing of otherwise non-erupting volcanoes.) The Siberian Traps erupted 10-100 times as much lava per year as our volcanoes do; a volume of 5 million km3 would emit the same amount of CO2 as current human activity would do over 2500 year – and remember that our emissions over the past 100 year have already added one degree C to global temperatures. However, the volcanic injection of CO2 was spread out over a much longer period of time. It is not entirely clear why the Earth wasn’t able to remove the excess CO2 over that time. Somehow, it didn’t, and the increase caused lethal heating. The global heating seems larger than can be explained solely from the Siberian Traps. Something amplified the global warming. Two suggestions have been made, and quite possibly both are right. The first is that the Siberian Traps erupted through a major coal layer and ignited it. The second is that methane hydrates at the bottom of the oceans suddenly became unstable due to the rapidly rising water temperatures, and a surge of methane entered the atmosphere. The latter seems plausible: methane is a powerful greenhouse gas. As mentioned, the extinction occured in two phases. The first phase coincided with the dramatic heating. At the same time, the Tethys ocean briefly became anoxic. The extinction event was sudden, and brief: it lasted less than 60,000 year, and possibly less than 6000 year. The shortest time over which it could have happened is probably a few hundred year, limited by the speed at which ocean water mixes. The second extinction pulse came 200,000 year later. It saw another temperature rise, but worse, the oxygen depletion now spread across Panthalassa, the world ocean surrounding Pangea. The entire ocean became a dead zone. Only the top layer of the water still had oxygen, mixed in from the atmosphere, but this region was also worst affected by the relentless heat. The oxygen loss in the ocean completed the disaster. Creatures that can live with little or no oxygen tend to favour cold water. But those creatures had already been eliminated. The oxygen deprivation caused havoc among the remaining survivors. Why the oceans became oxygen depleted is a matter of discussion. The ocean circulation clearly had stopped working, as happens in isolated bodies of water on our Earth, such as the Caspian Sea and Loch Ness, where deeper layers become a toxic soup of methane and hydrogen-sulfide. It doesn’t affect the open oceans, although there are growing anoxic events caused by run-away algae growth, fuelled by run-off fertilizer. The ocean circulation is driven by cold surface water in the arctic regions which is denser than the warmer water below and sinks to the bottom of the sea. It forms a conveyor belt circulation, finally resurfacing a hemisphere away from the place of sinking. Models show that this sinking of cold surface water may have stopped in the increasing heat of the Permian extinction. So the ultimate cause of both parts of the disaster was the run-away greenhouse. What was the world like during the extinction event? Very little life was left and the ecosystems were decapitated. Effectively all large animals on land and in the sea were gone. No animals, no trees, no fish – only a few survived at high latitudes. Some stunted bushes and ferns were found on land, and molluscs reigned in the sea. Stromatolites, an organised form of cyanobacteria, made a dramatic re-appearance. 2 billion year before, they had dominated the seas, but after grazers evolved they had withdrawn to regions where little else could live (such as the modern Shark Bay in Western Australia). Now they came back. Other microbialites also did well. (Microbialite is the general term for a bacterial mat that traps sediments: layered ones are called stromatolites, others are called thrombolites.) It was a world of cyano-bacteria: imagine the smell of blue-green algae across the world. Green algae, in contrast, were absent: they show a gap in their fossil record. Small snails fed on the bacteria and bacterial mats. This was the opportunity of a life time for the single cellular, and also the time when meek snails finally ruled the world. The tropics were wet, but hot beyond belief and probably covered in little more than fungi. Rotting and decomposition would have been very fast, and created soils very poor in carbon. The silent spring seemed never-ending. Recovery from life’s silence was indeed exceedingly slow. Conifer forests re-established themselves after 5 million year when temperatures finally moderated. Animals diversified again, spreading from the poles. But their evolution was punctuated by multiple smaller extinction events, possibly because the ecology remained unstable and became too dominated by single species, namely the ones that recovered fastest. Full recovery of the previous diversity took close to 30 million year. The large majority of families were gone, forever. Lystrosausrus Curvatus, a Permian survivor. Winner of the poorly-contested Triassic beauty competition. Of the surviving larger herbivores, Lystrosaurus, a pig-sized mammal-relative, became the most numerous, accounting for 90 per cent of vertebrate fossils. But it failed to diversify quickly enough and was overtaken by the archosaurs. 20 million year later, the archosaurs gave rise to the first dinosaurs. It took another 10 million year before the vertebrates on land had fully recovered. By that time the proto-dinosaurs had taken over the world. The next extinction event, 210 million year ago, cemented their dominance. The mammals withdrew into the shadows. Their chance would not come until another catastrophe, this time celestial and unpredictable, almost 200 million year later. The shadows of the Siberian Traps were long-lasting. The worst volcanic eruption on record changed the course of evolution – it re-shaped our world. And all because of an seemingly harmless gas, turned into a killer and an insecticide: CO2. All life depends on its environment. Interfering with the environment interferes with life, often in unpredictable ways. Bacteria can survive anything, but animals and other complex life forms can’t. Complexity comes with fragility. And the most complex of life is us. Most volcanic eruptions, even large ones, have limited impact: a few bad years, a local wipe-out; even Toba, the largest eruption in the past million year, did not permanently damage the world. In our days, no life form has gone extinct because of an eruption. However, eruptions also depend on their environment. Their effects can be worsened if the environment is already marginal. Iceland’s Eldgja eruption, in all its immensity, appears to have had limited impact, because when it happened the climate was mild and could withstand a shock. The Laki eruption, although smaller, was more devastating because the climate had become more hostile. A stressed environment lacks shock-resistance. 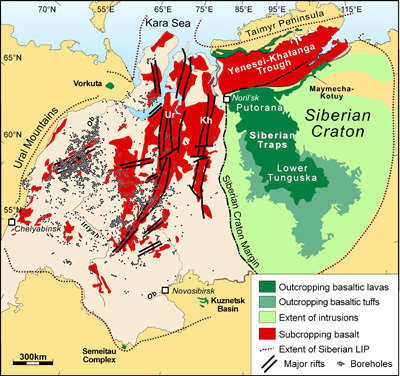 The Siberian Traps were massive, but they also erupted at a bad time, into an already stressed world. But there is more to it. Sometimes, a small change can lead to series of amplifying events. It is the drop of water that makes the dam collapse. The Earth has its critical points: push the environment beyond such a limit, and suddenly the world falls apart. In our days, ocean temperatures do not go much beyond 30 C: evaporation keeps it below this. But in the Permian, the Siberian Traps caused this safety valve to be broken. The water temperature leapt up by another 10 C, and mayhem followed. Climate can only self-repair up to a point: a badly timed push can tip it over the edge. The Siberian Traps did this, and they caused a lethal greenhouse. It is now 50 years since Silent Spring. And again we are producing a seemingly inert chemical in quantities the Earth cannot absorb. The Siberian Traps emitted far less CO2 per year than we do now; we are re-running an amplified experiment. The Siberian Traps once set the world aflame. We are still playing with its fire. Behind the crackles are the echoes of a silent spring. Thank you! It is sad to hear a about the bees. We had some lean years but last year was much better. Whether that was due to the weather, pesticide restrictions, or the bee-friendly plants is not known. Whilst that may very well be true, the Traps erupted near-continuously for about a million years (give or take a couple ten-thousand). So, unless we are over that eruptive emission output by a factor or 50, we are probably safe from a world-ending climate-hell-on-earth catastrophe for at least a few more millennia. Probably. However, if in 60,000 years we are still outputting at current levels, well then, all bets are off. Thanks Albert, you really summed up 99% of what I tried to convey when commenting on your previous post, then added incredible insight and depth to it. When I started to write that response, I hadn’t even fully understood the correlations from the p/t extinction to current climate change, but it became pretty apparent that there are quite a lot. The thing that many don’t understand, is that climate change is not just a carbon dioxide problem. It’s very complex, with many inter-related components as well as independent components that contribute to it. Other items like deforestation (which is related to aridification and other global warming), cattle production, and many other smaller factors likely have a big effect as well. And from what we know, methane has been rising in the atmosphere in recent years. This is likely a product of increasing cattle populations, but it also is likely a product of overall warming (which leads to release of more methane in permafrost and other regions). Another interesting climate change hypothesis that has a correlation to the P/T extinction that is fairly popular is that global warming could lead to a halt in the north atlantic drift, which essentially would mean that oceanic circulation would halt. Now, before this comes off as full-doomer, the scenarios we’re talking about in the P/T extinction happened in a MUCH hotter environment with much higher co2 than we currently have. But that doesn’t mean we aren’t playing with fire, and much more than we realize. Brilliantly written and fascinating! Especially the ending! On a different note, there’s an earthquake swarm developing in the Kistufell area, seems pretty interesting but is it particularly notable? A massively impressive, intelligent and thoughtful article. Thanks Albert! I learnt a lot reading it and it must have been hard work drawing it together. Many thanks. It is also worthy of note that the fungi were converting stored carbon to carbon dioxide at a pretty good clip, something analogous to human fossil fuel consumption. As long as forests regenerate or are replaced by plant cover combustion or decomposition is a zero sum game, but if the land ceases to be productive carbon dioxide will build up. There is some evidence for fungal evolution that allowed for more efficient decomposition in the late Carboniferous. What we know if Climatology, it’s that a stable climate system is dominated by negative feedback loops. That means, the more you try to push that system to change, the more it would inherently push back on the forces that are trying to change it. Of course, if you have a force strong enough to push back those negative feedback loops, that’s when things get out of whack. Forests have long been one of the components to keep climate in check, but unfortunately, deforestation is a thing these days. . Replacing mature forest with agricultural land or tree plantations has many negative effects, but increasing atmospheric carbon dioxide is not one of them. Replacing it with barren landscape, whether desert or concrete, does. One effect of global warming has been to increase photosynthesis worldwide, through increased temperatures in the subarctic and increased rainfall at desert margins. The earth is becoming greener. A nice example of a negative feedback loop. http://news.nationalgeographic.com/news/2009/07/090731-green-sahara.html?source=email_wn_20090807 link to reputable commentary on the greening of the deserts. Where human development has not intervened, the margins of the Amazon rain forest are also expanding. Replacing land from forest with agricultural land can have negative effects in the climate. Because many crops in the temperate world are annual, so for a third of the year these lands are naked, while while crops are grown, their CO2 capture ability is much less than if forests would have been there. Even decidious forests are better, because there are many perennials and life forms under the canopy. Second example, now in tropical lands. In Borneo much of the tropical jungle is cleared (burnt massively!) to give away for palm plantations, much less dense than the original jungle. So the original biomass is much less and hence CO2 capture. The CO2 released by burning is catastrophic. I saw it in early 2016 in Borneo and was shocked with the haze spreading around outside Borneo. It was truly massive, the scale of the event much more than Holuhraun eruption. We are disrupting many variables in the planet, and the consequences might be not only unpredictable but very agressive. I would expect an intelligent species by now to have played much more safely. What we are doing in insanity and when the leaders of the major countries in the planet are also oblivious to this reality, this is indeed a recipe for a disaster. We can´t deal with a larger economic crisis. What can we expect to deal with a massive climate change? How civilization will likely crash, I don´t have a doubt. If the damage is not massive, then recovery might be possible but the world is going to be much more hostile and many species would have disappeared by then. My fear is that with a stressed human world (fear, anger, diminishing resources and land, nationalism) come also wars, and eventually, nuclear war. It´s a big trial to human inteliggence. We are heading for massive problems. But I also believe they are solvable problems. If we try, we can do it. The one thing we should avoid is denying there is a problem. After that, it is no more difficult than walking on the moon. Walking on the moon was a massive achievement, but was entirely plausible because it was easy to get a small group of people (NASA) to work together to achieve a great cause. The issue with Climate change is that it requires all countries to come together and agree on certain set regulations. All of this would occur in the face of some obvious incentives to not make those changes (cutting regulation unfortunately, does create economic advantages for said country). While going to the moon on paper seems super difficult, especially with respect to the technology at the time, it doesn’t compare to how difficult it is to align so many people and countries with entirely different beliefs together to fix one cause. It will need concerted effort. But you’d be surprised how much you can do. We need to move away from fossil fuels, but alternatives (apart from nuclear which can only be a stop-gap as the amount of available uranium in the world is also not infinite) produce less energy than fossil fuels do. So we need to reduce our energy consumption. Going through the numbers, we need about 2% reduction per person per year. Can you do that? We use about 20kWh/day in our household (covering a fair number of people), so we need to reduce it by 0.4kWh/day this year. We just changed two ‘energy-saving bulbs’ (which do save energy but also seem to save light) by LEDs. Two 20-W bulbs were replaced by 13-W LEDs. They are on for perhaps 7 hours/day in winter, which saves us 0.1kWh/day. But because they are much brighter than the ones they replace, we also use other lights less. On the other hand, summer savings are much less. So it is a start but we need to do more. If you have halogens, replacing by LEDs is a no-brainer and gets you well on the way. Small reductions in heating and driving are also easily done. I rented a car in California last month. I couldn’t believe how fuel-inefficient it was (hadn’t seen that kind of fuel consumption for many years!) Again, an easy saving can be made. Exercise for the student: what can be done? So I still believe it is a solvable problem. So, basically, for a while Earth was Tattoine? Extremely interesting. 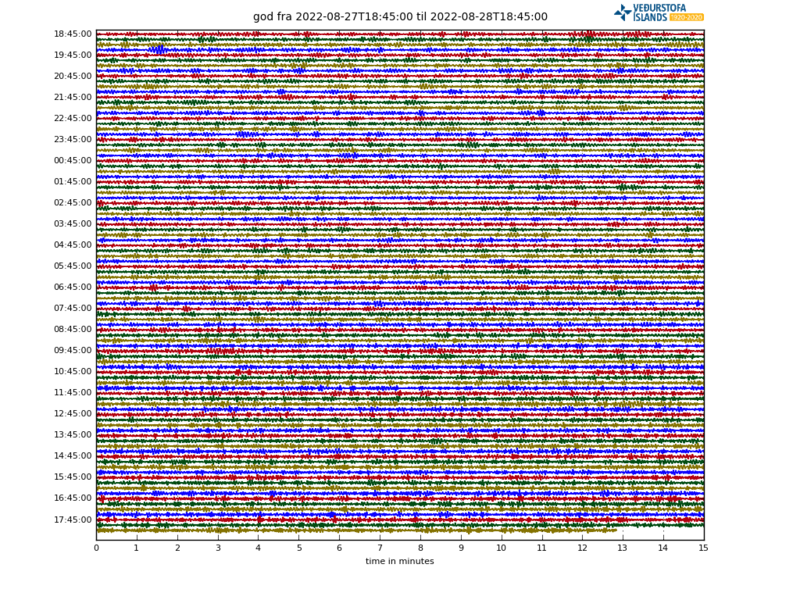 Many quakes, quite nice size (up to M2) and depth might be not so shallow…. But as the large shield volcano was sleeping until now, I don´t expect this to be nothing more than just a swarm. Albert, thanks again for another great learning experience. Question: I understand the heat on Venus is due to CO2. Do you think it is cyclic? No, Venus is far past the point of no return. The amount of CO2 is 250,000 times that in the Earth’ s atmosphere. What happened is that the heating on Venus extended into the stratosphere. That is not the case on Earth: because our stratosphere is so cold (and cooling: that is a consequence of surface warming), the air there can’t hold any water. It acts as a lid keeping all the water below it. Venus took off that lid. Water went up, and entered the upper atmosphere from where it could escape. Over time, Venus lost all its water. (We know this because normal water escapes, but heavy water stays behind. Indeed, the little there is on Venus is all heavy water.) Without water, there is no efficient enough mechanism for the CO2 to be removed from the atmosphere. If you wonder why global warming cools the lower stratosphere (around 15 km height): it is heated mainly by radiation coming from below. The greenhouse effect traps more of that radiation, and therefore reduces the irradiation in the stratosphere. The lower stratosphere has so far cooled by about 1C because of this, mostly since 1980. In contrast, a volcanic eruption will case warming here, from the injected sulphate which absorbs solar radiation. Any eruption which cools the surface must warm this region. These spikes are 3C or more, but only last 1-2 year. Higher up in the stratosphere (20+km), ozone absorption becomes important. This region cooled when ozone was being destroyed, but as ozone is now recovering a bit, there should be some re-warming. Climate modeling is complex, but the basics are now well understood and the models and data are broadly in agreement. Pluto would do. It has about the same amount of water as Earth. 1/The atmospheric CO2 level was above 800ppm up until 20 million years ago, most plants (C3) are inhibited by the current CO2 drought as they evolved at much higher concentrations. CO2 is the basis of carbon based life on this planet. Below 180ppm photosynthesis stops and all life that depends on it will die. 2/The study that found a link between DDT and the thinning of eggs shells has never been able to be repeated by independent sources. I’e it was either a fluke or a fraud. The banning of DDT also lead to the re-emergence of malaria with tens of millions of preventable deaths as a result. Not that I don’t agree the sentiment but as they say the road to hell is paved with good intentions. The plants will have no problem with higher CO2, nor will animals. There will be a problem in the seas as the pH will drop. Molluscs and corals will need quite a bit of time to adjust (you are talking about 100,000 year to re-evolve what they need, I expect). In the more acid sea water, their shells will dissolve. That already happens at depth but will move to progressively shallower levels. CO2’s main problem is its effect on climate. DDT is listed by the EPA as a accumulative (it builds up in tissue and doesn’t decay) and probably carcinogenic. It is like eating plastic. I think thin shells are the least of your worries! We have better ways to combat malaria. But DDT is in fact still authorised for malaria, and there are reports that DDT concentrations in wild birds are rising again. But i have doubts about your statement that DDT does not cause egg thinning. I have not found a single scientific study claiming this. There are a fair number of claims in the popular press, but they do not seem to be based on scientific papers. In one case, the writer clearly had not understood the paper, and interpreted ‘a negative correlation between shell thickness and DDE levels’ as no correlation, whereas it means exactly what it says: more DDE (the DDT product affecting the calcium metabolism) gives thinner shells. Unless you can locate the scientific basis, I’ll see this as a convenient myth. I found an interesting article that listed a great number of studies claiming to show that DDT did not cause eggshell thinning, and that the Peregrine Falcon decline in the US and elsewhere was down to other causes. 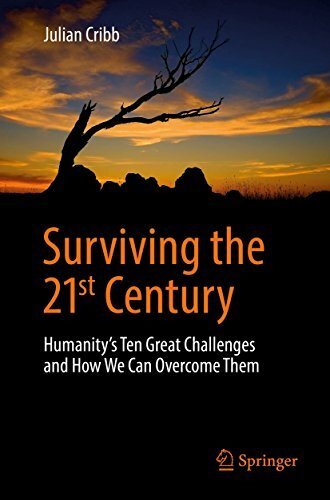 Seemed compelling, but it turns out the guy who wrote it is a ‘celebrity climate debunker’ so I’ll keep an open mind and see if I can’t find out more. (My own thoughts, before I found out more about the writer, were that a great deal of the studies referred to were based on exposing domestic poultry to DDT, and I wonder if that’s really going to replicate the kind of top-of-food-chain accumulation seen in Peregrines. “After residents complained for years about dead birds in their yards, 22 American robins, six European starlings and one bluebird were collected last year. Waaaay too many humans are f888ing with our habitat in sooo many ways, not only cc/gw. Today’s grandchildren will not live a reprise of their grandparents’ lives. Their prospects are grim. Wheee! 10 more minutes and I’ll be clear of it. Looks like a rotation cell is gonna hit the north part of the county through. Sitting in a train config as these storms roll in. Some of the rainfall rates are 10 to 20 inches per hour. Are you ok now? I’m waiting for the winds to die down myself. Yeah, the last band rolled through here this morning. It’s all out towards Tallahassee now. I was listening to a Fire Rescue call last night and the EMS unit asked if there was room at the end of the dirt road to turn around. The dispatcher responded that they had taken a fire truck down there so probably yes. What the dispatcher didn’t mention was that it was a brush truck, not a normal engine. A brush truck is essentially a well equipped 4×4. I never heard them call for a tow truck, so I guess they got in and out with no issues. I do know they called for manpower assistance in getting the stretcher and patient back to the ambulance. Hopefully they didn’t have to work a code on the way. Not an easy task performing CPR on a moving stretcher. The only other calls I heard were one station working a lightning strike on a dwelling. The caller had reported that the closet had smoke coming out of it. The crews reported a smoldering box, and a scorch mark on the carpet from the lightning. On the back side of the front this morning, the winds were whipping hard. Now they have died down and the temp has dropped a bit. Scanner traffic is encrypted, but I was able to hear lots of power lines down and a tree on fire. Glad you are okay, just one friend left on the line, in Palm Beach. Encrypted or trunked? Our sheriffs dept is trunked and encrypted. Seems our local paper mill has exploded. It’s 8.5 km from here and it shook the house when it went up, there have been a couple of smaller secondary explosions. The way they are talking it sounds like a boiler went up. Debris or some substance on the road has caused some vehicles on Hwy 29 to spin out. I haven’t heard them this active since our jail blew up. Interestingly, that jail explosion was also shortly after a heavy rain. From what I’m hearing, it’s a kraft process plant and they have black liquor all over the nearby highway. fires-in Arizona of all places, same mill. Nasty if it gets going. The black liquid shouldn’t be too much of a problem but these mills can produce toxic chemicals. I don’t know how strict the regulations are, but I would stay away from the immediate area for a while! About 8 km from here. It shouldn’t be ant more nasty than the 3 tank cars of phosphoric acid that derailed and spilled in McDavid a couple of years ago. F DEP is already looking into it. Rumor states that they were already under OHSA citations about that boiler. Bad timing for them. I assume Digital Trunked, I am using Broadcastify at the moment since I am not prepared to buy a digital, it is expensive and I am short on time. Wow an M8 struck in PNG under Bougainville Island, at around 150km depth. If you ask me, that must have sent a nice jolt across the volcanoes on this island. If wont trigger eruptions but it might it might provide some further destabilisation to perhaps any unstable volcano in that area. A big one, luckily quite deep. Earthquakes this size are not uncommon in this area (every few years an M8 or close) but this one was right underneath an island and there are reports of some damage. Agree, Most of the activity at Katla has for a long time been extremeley shallow type 0,1 km. Here comes a deeper low magnitude swarm. OK, not very deep but maybe related to the magma chamber rather than the surface of the lid. will be interesting to see, if there’s another swarm tomorrow morning! And now a shallow swarm again. Wonder if this resulted from the deeper one yesterday? One of Ians time plots would be interesting! Could the M8 earthquake have anything to do with the M5.2 earthquake around Easter Island and the M5.2 West Chile Rise? m5.2 level earthquakes occur around the world all the time. They do not carry enough power to cause any shifts or effects on faults thousands of miles away on entirely different fault systems. In some scenarios, larger earthquakes such as the one we saw in New Zealand somewhat recently can cause instability in other nearby fault systems, but that only tends to be the case when the fault shifts pressure from itself to other faults that are in close proximity. Across an entire ocean with the faults not connecting to each other, this does not have any affect. Add to that the M 8.0 was 150 km deep. That puts it on the dangling part of the down going slab. There is a lot of ductile material between it and Easter Island. Thanks Albert for another exciting post! Love the combination of science from many angels and fields. All intelligent comments with info grows it further! Randy Marsh has been around for a Loooong time. I also don’t think lower sea levels make this accessible on foot. So, boating is also a possible skill set. And a facial reconstruction from what or may not be a cast of the skull of Robert the Bruce. The cast was made several years ago and all we have is the word of the group who made the casting… almost 100 years ago. How about that-they weren’t stupid..
upgraded to M3.9. 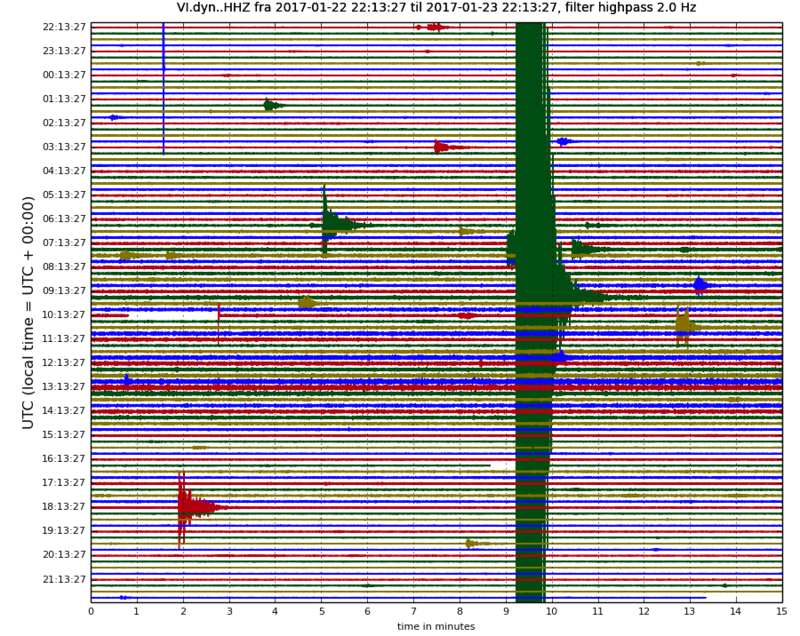 more distant seismos show more than one bump. I wrote a page / post discussing Katla’s quakes if anyone is interested in reading some more – website is still under slightly under construction 🙂 . Thank You for doing that, appreciate it! That seems to make some sense to me. I did however see quite a few deep earthquakes at Katla over the summer, this occurred during a period where I was noticing a lot of deep quakes all around Iceland, most notably around the Askja, Katla, and Bardarbunga regions. They still are occurring, but not to the level they were back then. Hi Noticed something, a conflict. With in the article you mention the following. But previously you had written this. ” But once subduction ceases, when the supercontinent is in place, CO2 levels begin to rise, and temperatures in consequence go up”. So isn’t clear why the Earth wasn’t able to remove the excess? Good question! Over a long time scale, you are right. Over a short period, there are various CO2 sinks which can absorb some excess for a while, until they saturate. Part of this is the biosphere: higher CO2 means faster plant growth, which in principle locks some CO2 into organic matter. Over time, decay will put it back into the atmosphere so it is only a temporary reprieve. Same for the ocean: they absorb CO2 until they are in equilibrium with the atmosphere. Currently, roughly half our CO2 emissions are absorbed by the ocean. That rate is limited by how quickly the ocean overturns, and that can vary over time. So there are some ways the earth can help. But in all these sinks, when they are full, all further CO2 emissions go directly into the atmosphere. The Permian extinction shows that the sinks were not sufficient to stop the relentless heating. A new article is up against the legal case in Japan!